This summer, images by dozens of famous American artists will be plastered on 50,000 displays from electronic billboards to bus shelters, an initiative by leading museums and the billboard industry to create one of the largest outdoor art exhibitions seen in the country. 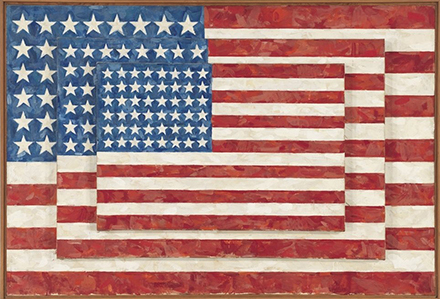 Images by dozens of famous American artists, like "Three Flags" (1958) by Jasper Johns, will be featured on 50,000 displays from electronic billboards to bus shelters. The project, called Art Everywhere, is a partnership of leading museums and the billboard industry. Museum directors hope the project, called Art Everywhere, will draw more visitors to their galleries, while the Outdoor Advertising Association of America, devoting about $500,000 to the effort, is betting that great artworks will make looking up fashionable again. With the web pulling dollars away from billboard advertising, some in the advertising industry see it as a move to get millions of Americans to “take your head out of your phone,” explained Rob Schwartz, the global creative president of TBWA, the worldwide advertising agency. Five museums collaborated — the Whitney Museum of American Art, the National Gallery of Art in Washington, the Dallas Museum of Art, the Art Institute of Chicago and the Los Angeles County Museum of Art — with each submitting 20 works from their collections, from gritty urban scenes to ’60s Pop Art to challenging images reflecting race and gender politics. They include Mr. Johns’s “Three Flags,” Gilbert Stuart’s portrait of George Washington, Grant Wood’s seminal “American Gothic” and Glenn Ligon’s self-portrait of his shaved head. 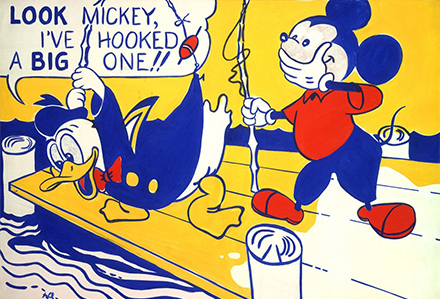 "Look Mickey" (1961) by Roy Lichtenstein. Five museums - the Whitney Museum of American Art, the National Gallery of Art in Washington, the Dallas Museum of Art, the Art Institute of Chicago and the Los Angeles County Museum of Art - each submitted 20 works from their collections. Beginning on Monday and running through May 7, the public can view the 100 selections at ArtEverywhereUS.org and vote for favorites. The 50 images that receive the most votes will be announced on June 20 and be reproduced on outdoor displays coast to coast in August. From the Long Island Expressway to the Los Angeles freeways, many billboards that once publicized sneakers or airlines or cars have gone blank. Companies cut marketing budgets during the recession, and lawmakers, as well as homeowners’ associations, have tried to restrict the spread of digital billboards and new sites with size and content limitations. Revenue for the outdoor advertising industry fell at an average annual rate of 1.6 percent over the five years preceding 2013, according to a report last fall and although revenue is beginning to improve, industry analysts are skeptical that the campaign will create a billboard renaissance. Starting on Aug. 4, for one month, it may be hard not to notice the ads, especially in hubs like Times Square, where the artworks will saturate the landscape on about a dozen billboards in rotation. Art Everywhere is a copycat version of an initiative in Britain last summer. 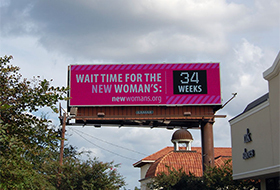 It received so much positive attention there that the outdoor advertising trade group asked Maxwell L. Anderson, director of the Dallas Museum of Art, to help bring it to the United States. 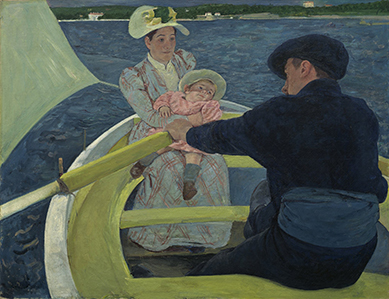 "The Boating Party" (1893-94) by Mary Cassatt. “There’s great art in England, but nothing like American art,” said Stephen J. Freitas, the chief marketing officer for the Outdoor Advertising Association of America. He said revenue in outdoor advertising has grown significantly in the past year, making it the second fastest growing media segment after online formats. “The billboards that are dark are that way because of zoning issues or actions taken by the City of New York, not because of low demand,” he said. Mr. Anderson, who saw the initiative as a way to celebrate American art, contacted four other museum directors, geographically selected, and asked if they would be interested in participating. “Everyone wrote back to me within a day,” he recalled. “There were obvious duplications,” he said. Settling on particular artworks “took a bit of fiddling,” he added. “We knew the images had to have graphic possibilities,” Mr. Weinberg said. 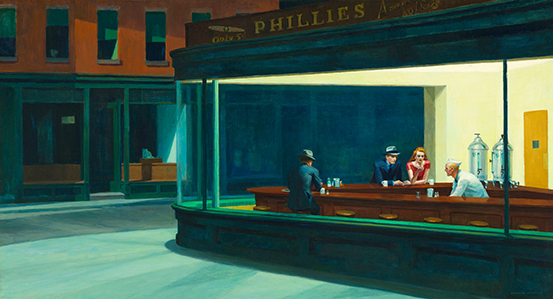 Douglas Druick, director of the Art Institute of Chicago, said the museum chose “American Gothic,” that 1930 painting of a stern farmer and his dour daughter, along with Hopper’s “Nighthawks,” the evocative 1942 scene in an all-night diner with three strangers seated at the counter. “In the end, it doesn’t matter who the artist is, people are going to vote on the images that strike them,” Mr. Druick said. "Nighthawks" (1942) by Edward Hopper. The 50 images that receive the most votes will be announced on June 20 and be reproduced on outdoor displays coast to coast in August. Social media will extend the message, letting people share their impressions of the art through numerous interactive platforms. Some seasoned advertising executives are skeptical about the mission of Art Everywhere. “People are going to perceive the art as advertising,” said Peter Arnell, the branding impresario who created the much-praised Donna Karan DKNY campaign in the late 1980s, when he had the logo — with a photograph he took himself of the Statue of Liberty and the Manhattan skyline — hand-painted on a building in SoHo. Lamar Advertising Company (Nasdaq: “LAMR”) will release its first quarter ended March 31, 2014 earnings report before the market opens on Wednesday, May 7, 2014.